Javier and Christiana Candon had a familiar plan when they chose to open a restaurant in Washington, D.C. — they wanted it to be all about family. But when others may have accomplished this goal by ordering more chairs and cooking larger portions, this couple decided to take this plan literally. Their Spanish eatery, named Joselito Casa de Comidas has a design that uniquely reflects this family's storied history, from the personal touches to the Spanish-sourced materials. The name itself is an homage to Javier's father, who may be seen in an intimate collection of black-and-white photos that feature beloved relatives on the main wall. 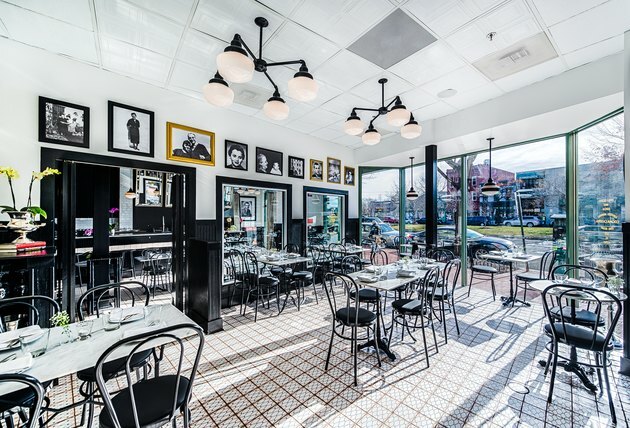 That throwback collage is accompanied by curved bistro chairs and beadboard panelling, which help create the feel of a midcentury diner. 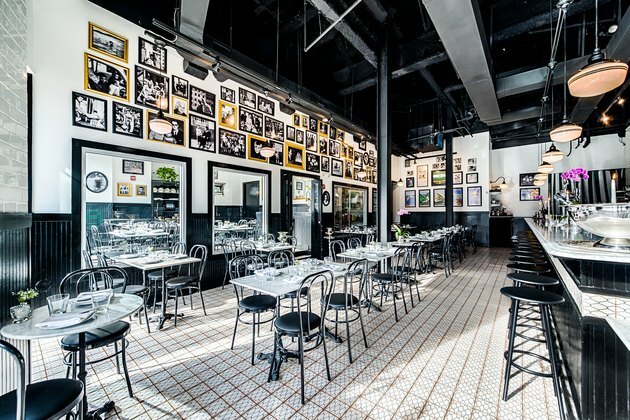 But the space isn't entirely from a bygone era: floor-to-ceiling windows, a monochromatic palette, and clever pops of color provide of-the-moment finishes, giving the locale a mix of modern and traditional style. It's proof that a black-and-white color palette will always be a safe bet for a look that's effectively timeless and trendy. 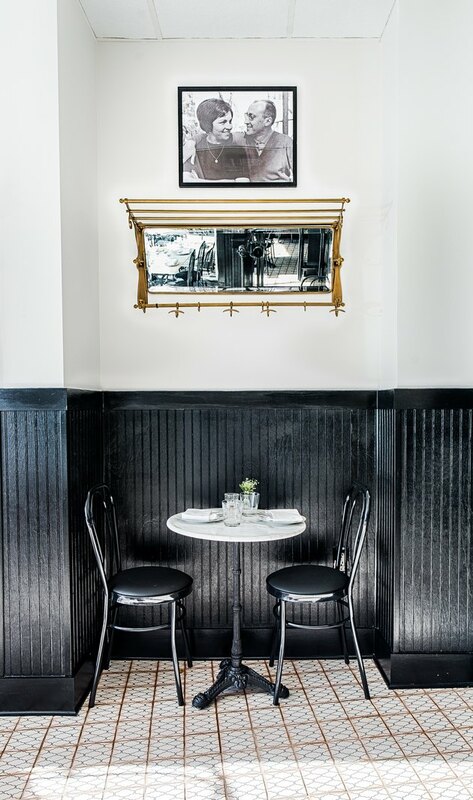 The focal point of the restaurant is the artfully-placed Candon family photo wall, which dates back to the early 1900s. The back wall features vintage travel posters of Huelva, the province in Southern Spain where Javier's parents were born. Barn Light Electric fixtures hang over the dark-wood bar, which spans the length of the restaurant. 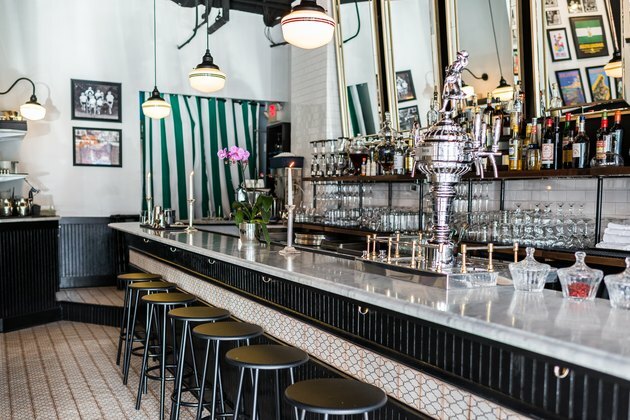 The tiles below the bar match those on the floor, and the traditional pendants overhead are in keeping with the familial design. The couple decided to keep the glass windows that once separated the property's one-time cheese shop from the cheese-making room. The extra space can now be reserved for parties and special events. Large plate-glass windows stream in light from the street. The marble tables and bistro chairs were made in Spain specifically for the restaurant, and sit on Spanish-made Merola Tiles. 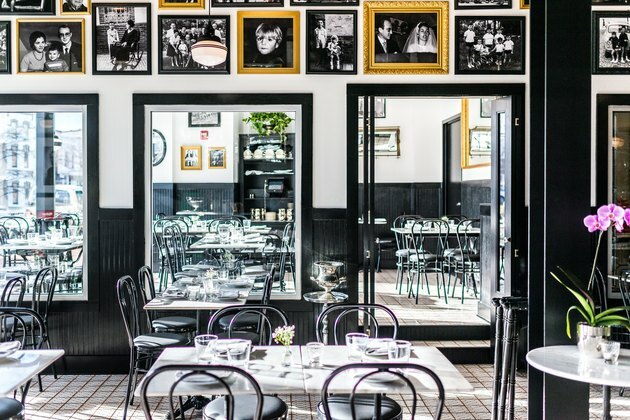 While the palette of this restaurant is traditional, it's also timeless: a black-and-white aesthetic that's punctuated with subtle hints of color will never go out of style.